Shirley Anita St. Hill Chisholm (November 30, 1924 – January 1, 2005) je oloselu, oluko ati olukowe ara Amerika. O je omo-egbe Ile Asofin, nibi to ti soju fun Agbegbe Ile Asofin 12k New York fun igba emeje lati 1969 de 1983. Ni 1968, o di obinrin alawodudu akoko to je didiboyan si Ile Asofin Amerika. ↑ Barron, James (3 January 2005). "Shirley Chisholm, 'Unbossed' Pioneer in Congress, Is Dead at 80". The New York Times. http://www.nytimes.com/2005/01/03/obituaries/03chisholm.html. Retrieved 24 December 2010. ↑ PBS P.O.V. documentary. "Chisholm '72: Unbought & Unbossed"
↑ Freeman, Jo (February 2005). 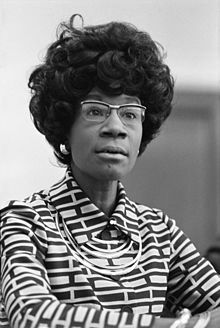 "Shirley Chisholm's 1972 Presidential Campaign". University of Illinois at Chicago Women's History Project. http://www.uic.edu/orgs/cwluherstory/jofreeman/polhistory/chisholm.htm. Àtunṣe ojúewé yi gbẹ̀yìn wáyé ni ọjọ́ 10 Oṣù Kẹta 2013, ni ago 14:21.